WASHINGTON -- A senior U.S. lawmaker says that the future of the European Union could be in danger if "Kremlin-backed politicians" come to power in France. The statement by Representative Ed Royce (Republican-California) on March 9 comes ahead of April's first-round presidential election in France, whose foreign minister has suggested that Russia is targeting pro-EU candidate Emmanuel Macron with cyberattacks and a campaign to influence public opinion in France. "The stakes are high. If Kremlin-backed politicians take power in France, it could potentially spell the end of the European Union," Royce said on March 9 in opening remarks at a hearing about Russia by the House Foreign Affairs Committee, which he chairs. 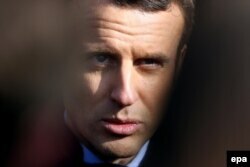 Macron's aide said in February that his campaign's computer system has been hit by a surge of cyberattacks coming "from the Russian border" and that Russian state media is trying to discredit the candidate with "fake news." The Kremlin denied the allegations. French Foreign Minister Jean-Marc Ayrault suggested in February that Russia is targeting Macron with cyberattacks while showing a preference for the candidate's more pro-Russia rivals: nationalist Marine Le Pen and conservative Francois Fillon. Ayrault warned that France "will not accept any interference whatsoever in our electoral process, whether by Russia or any other state." U.S. intelligence agencies have concluded that Russia was behind a hacking and public opinion manipulation campaign aimed at helping Republican Donald Trump win the 2016 U.S. presidential election, a charge Moscow also denies. Speakers at the March 9 congressional hearing, which focused in part on alleged Russian "disinformation" aimed at “undermining democratic institutions,” include former Estonian President Toomas Hendrik Ilves and Daniel Baer, the former U.S. ambassador to the OSCE. The committee’s top-ranking Democrat, Eliot Engel of New York, said in his opening remarks that while "disinformation is a problem…a much bigger problem is that a hostile foreign government committed criminal acts in an effort to undermine American democracy." "At Vladimir Putin’s orders, Russia's agents tried to swing last year’s election in favor of President Trump. Those actions were an attack on our country. And if we don't respond effectively, Putin will become an even bigger threat to the United States and our allies," Engel said. The alleged Russian hacking and public opinion manipulation campaign -- as well as contacts between Trump's associates and Russian officials -- have become the subject of intense scrutiny in Washington, where several different congressional committees are looking into Moscow's purported meddling in last year's election.